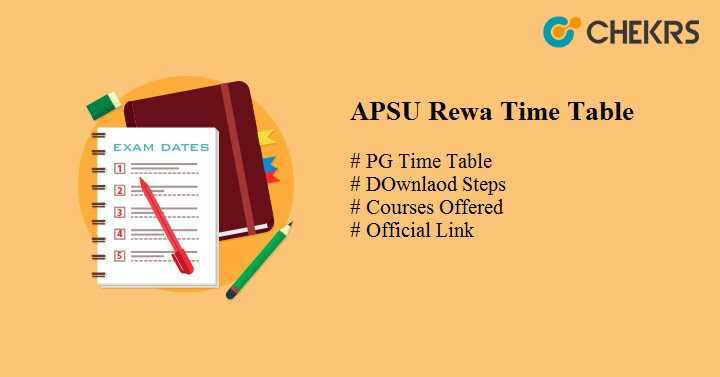 APSU Rewa Time Table 2019: Students of the Awadhesh Pratap Singh University (APSU) are required to know about their postgraduate examination. Latest Update:MSW PGDCA TIME TABLE DEC 2018 Released!! Check the link given below. The university will soon go to the conduct the exam of Postgraduate courses i.e. (MA MSc MCom MCA etc). The university organizes the exam in the semester way and had already conducted the exam odd sem. Now it is a turn of the even sem exam (2nd 4th). The university will soon release the APSU PG Exam Time Table 2019 on the official site. The students of the APS University will be able to access their time table from the table given below. We will provide here the link of the Rewa University Time Table 2019 after it will release by the university. It is necessary to download time table as it contains all the details of the examination we will give here the link after it will release officially by the university. Go to the official site of the university. The list of the time table appeared on the screen. Every year a large number of the students apply for the APSU Exam. So candidates who scored good marks in the exam and interested to take admission can prefer the any of the subjects in the following courses. We are giving here the table in which all the details of the Courses Offered By APSU is given. Physics: M.Sc., M.Phil. , Ph.D.
Computer Science: PGDCA, MPhil, Ph.D.
Maths & Statistics: MSc, Ph.D., M.Phil. Business Economics: MA, MPhil, Ph.D. The APSU University was established in the year 1968 got the UGC Recognization in February 1972. The university is spread over the 246.20 acres of land in the north of Rewa city which is at a distance of 5 km with its campus which lying on either side of Rewa- Simour Road.